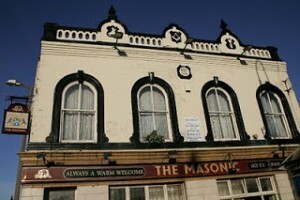 This is a photo of The Masonic pub in Runcorn, Cheshire, which actually features in my first book The Genesis of Freemasonry, but is also discussed as an early Masonic Hall in the second book as well. It was built in 1863 and is a beautiful building; displaying numerous Masonic symbols on the front. It was the location of the local Ellesmere Lodge from 1863-1932, and the lodge still meets in Runcorn today. The pub had an additional level but it was altered a few decades ago. This is a photo of the Egyptian Suite in the Masonic Hall at Hope Street, Liverpool. 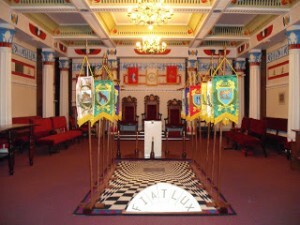 It is a Chapter Room which reveals the imagery associated with the Royal Arch Ritual. The photo features in my book The Transformation of Freemasonry, and will be available as a colour photo in the hard back special edition of the book which is published later this month, which will have colour plates as opposed to the black and white photos available in the current soft back edition. 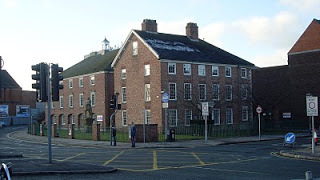 The book discusses how Masonic Hall’s became popular with lodges during the later half of the nineteenth century, and also discusses how the Royal Arch ritual developed – a ritual which was considered as a fourth degree by the ‘Antient’s’ Grand Lodge and by the Liverpool Masonic Rebels and the Wigan Grand Lodge. I’ve had a few requests to post up some of the photos which appear in my new book ‘The Transformation of Freemasonry‘, there are quite a few photos in the new book and all relate to the historical events which are discussed, such as the Warrington Dissenting Academy which was opened in 1757 and had two Masonic tutors from the local Lodge of Lights, the Academy creating a cultural circle in the developing Industrial town, a circle which included other Freemasons. I took a number of shots of the old Academy building – one being chosen to go in the final proof of the book, though all the shots reveal its elegance and Georgian splendor. 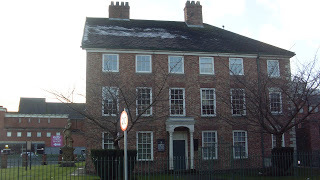 The Academy moved to another larger building in Warrington in 1762, but finally closed in 1786. The statue of Oliver Cromwell now stands outside to the left of the building in the photo. The book uses local studies in England and Wales to put forward how Freemasonry transformed itself during the late eighteenth and nineteenth centuries, and discusses the themes of education, charity and how the local Freemasons assisted in developing their communities, both culturally and in developing civic improvements. More photos from the book will be posted soon.